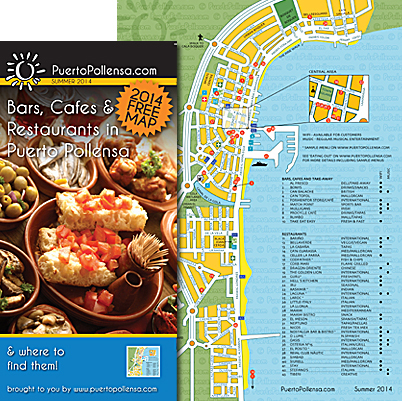 We're very pleased to announce the launch of the Summer 2014 edition of our printed leaflet with a map of Puerto Pollensa listing 43 featured Bars, Cafes and Restaurants (also listed on the website at Restaurants, Cafes, Bars in Puerto Pollensa.) The leaflet is available from the tourist office and various other outlets throughout the port. As a bonus you can also download the map from our website at Restaurants, Cafes, Bars in Puerto Pollensa and print it out BEFORE you go - personal use only!